This BioProvince (as defined by Armen Takhtajan) comprises the Atlantic islands of Madeira and Port Santo, and the uninhabited Desertas and Salvage islands. The islands have a volcanic origin, which in the case of Madeira dates back to the Miocene, and is therefore largely composed of erodic basaltic lava. It is now also deeply incised by several river valleys. The climate is subtropical with northerly and northeasterly winds providing up to 2000 mm of rain in the north and a maximum of about 1000 mm in the south. The flora, which totals some 1,158 vascular plants, includes two endemic genera (Chamaemeles and Musschia) and over 180 endemic species. Several genera have undergone major diversification. For example, on the mainland in Northern European there is only one species of Echium (viper’s-bugloss) and a few more exist in the Mediterranean, but in Macaronesia this genus has undergone major diversification with 25 endemic species on the Canary Islands and two endemic species on Madeira. 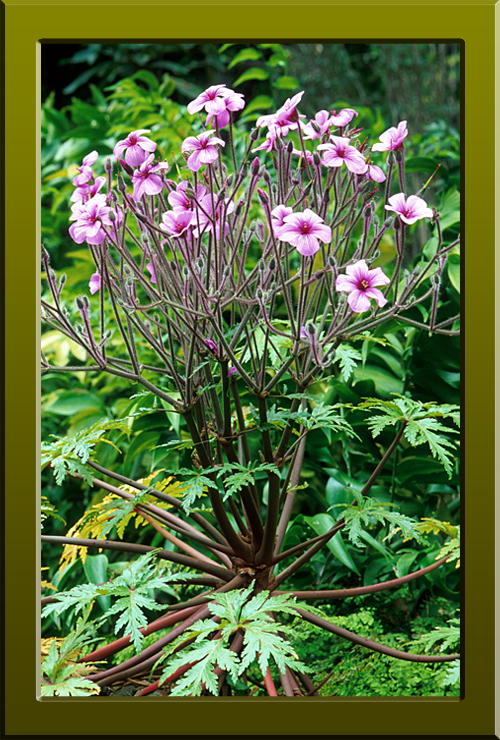 These colourful plants are highly valued by Madeiran people and have been given the general name ‘Pride of Madeira’. The succulent genus Aeonium (house-leeks) has also become particularly diverse in Macaronesia with 38 of the 40 known species confined to this region, although most (34 species) are only known from the Canary islands. On Madeira there are two endemic species (Aeonium glandulosa and A. glutinosum). The other two species are scattered over North Africa and Arabia.